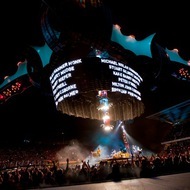 Amazing opening night of two in front of 70,000 at the Olympic Stadium in Sydney. And some special guests in the house tonight including Oprah who gets a special shout out in Beautiful Day ('Oprah Winfrey right in front of me') and Bob Geldof, whose 'Do They Know It's Christmas' finds its seasonal way into opening 'Stuck In A Moment'. 'Stuck' was dedicated to Michael Hutchence and his spirit was with us in a couple of INXS moments during a soaring version of Bad which featured snatches of Need You Tonight and Never Tear Us Apart - the whole stadium adding backing vocals. A young girl called Jana joined the band onstage for In A Little While: 'Are you a singer? ' Bono asked her. 'You should be a singer!' For Scarlet and Walk On thanks went out to people who put their energy into the campaign to release Aung San Suu Kyy. 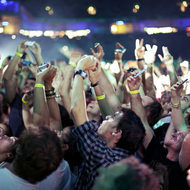 Were you at tonight's show in Sydney? Add your own review and upload your photos below. Saw the Boys in Sydney Dec 13 with my 11 yr old daughter. We loved every moment. 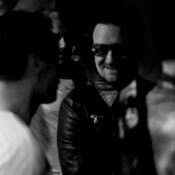 Who else but Bono could sing Amazing Grace to a rock audience? Beautiful. 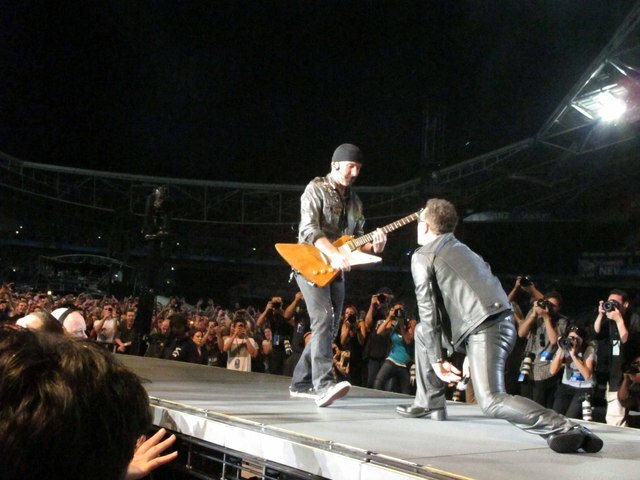 This was the fifth time I've seen U2 in Sydney. 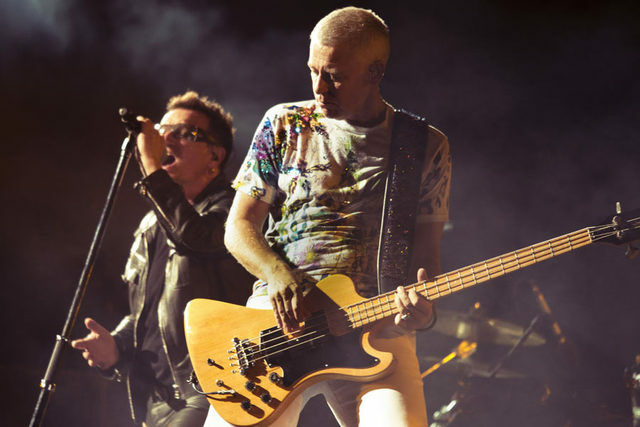 What made it special for me was that I had my 16yo daughter with me and my sisters who have all become U2 converts over the years(how could you resist?) I didn't think I was going to make it at one stage as flood waters threatened to block off all roads out of town, BUT, thankfully, rains subsided and the weather that night was absolutely perfect. Hard to pick a favourite, although 'I Will Follow' right at the beginning set the tone for the night perfectly. To add to that, we had great seats right down next to RED ZONE so all in all the concert was everything I'd hoped it would be. Only one thing could have made it better..if the boys could have added "Pride" to the setlist!! 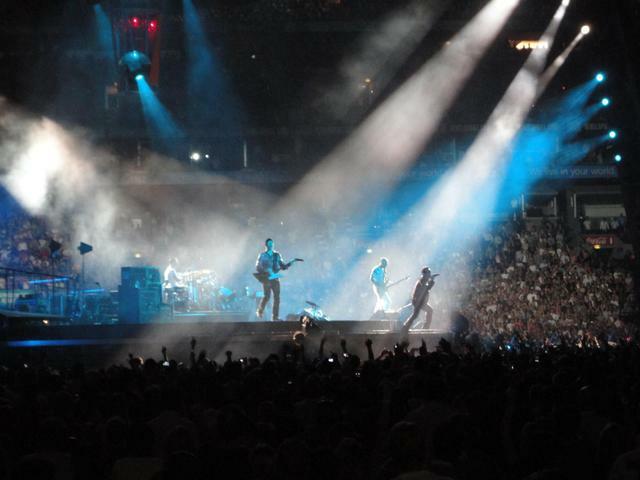 The show was amazing, it's my third time seeing U2 live, saw them at Slane 2001, that's when I got hooked!! 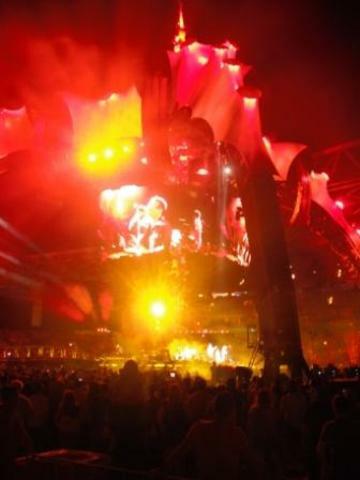 & in Croke Park in 2009....but I have to say, Monday nights show was just unreal!! 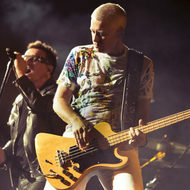 Every minute of the show was captivating....no other band can connect with an audience like U2 does....I can't even chose a favourite part, hearing In a Little While, Bad & Hold Me, Thrill Me, Kiss Me, Kill Me were great surprises but the whole concert was brilliant! 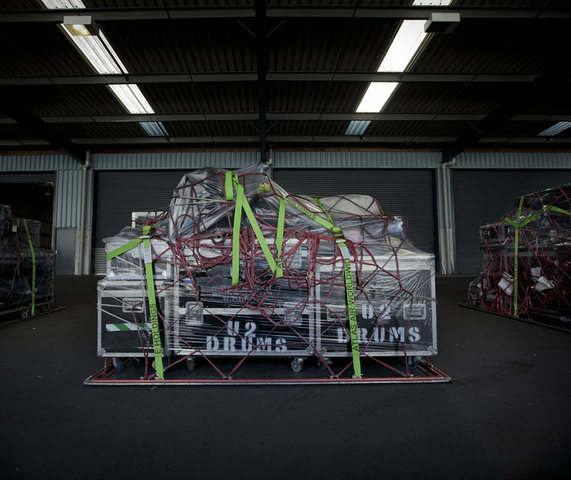 !The feeling was really summed up 4me when Bono said he didn't wanna leave....thats exactly how everyone felt, we didn't want it to end! 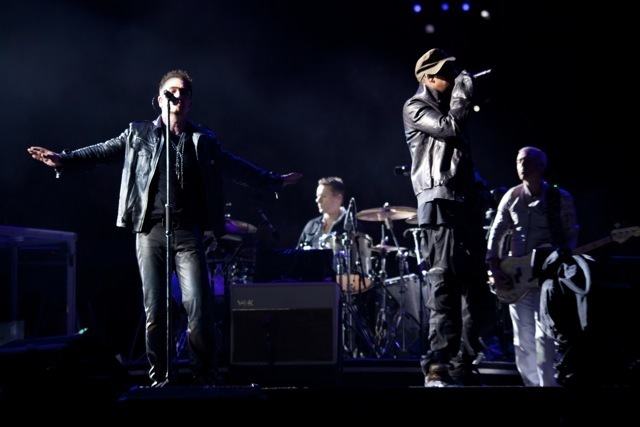 !I hope U2 are around for a very long time to come....the best band in the world! What an unbelievable show! So many highlights including "Until the End of the World" played with so much passion and energy, hearing "Bad" live for my first ever time and Bono's passion at the end of "One", but I can't go past the beautiful "Amazing Grace" into "Streets"...that was quite a powerful and emotional moment that I'll never forget. Thank you U2 for an amazing night. 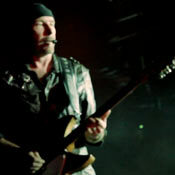 This is my 2nd U2 concert, 1st one being Vertigo tour of Japan! 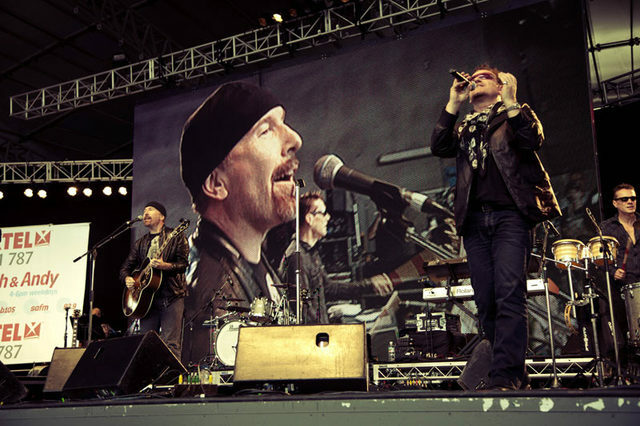 Without doubt, U2 is the Greatest Rock Band on earth! Awesome stage settings,Electrifying performance and Intimate connection with the Crazy audience!!! 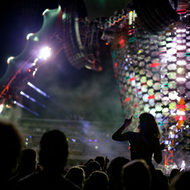 3 words to describe my 360deg experience: Fantastico! Magnifico! Electric co! 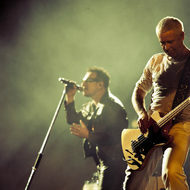 U2 Rocks!! Cheers n Regards, Saini from Singapore! fantastic show. 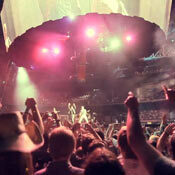 i have been to all u2 shows in sydney including 1984 Unforgettable Fire tour. Monday and Tuesday nights were both fantastic, cant split them. Go crazy was brilliant but the best for me was 'BAD" an unbelivable song, sung and played to perfection. Most memorable moment was that i went with my three daughters, 18,16 and 13 yrs old. They loved it, they cany stop talking about it, especially when Adam looked straight at us for a few seconds whilst at the front of the outer stage. all four of us qued all day and got a fantastic position. Could do all again every day of the week. cannot wait for the next tour. How they are going to better this tour though i do not know. Absolutely brilliant. First show in Sydney was fantastic! So glad to have been a part of it and see it with some close family members and friends. Was a great night, and will be the only thing i talk about for weeks maybe months to come! Wow, what a nice surprise to hear a snippet of Rejoice, one of my favorite tracks of October. It sounded amazing... I also loved Bad, which I managed to share over the phone with my beautiful sister - at work in the Netherlands. A very expensive phone call, but she loved every second of it and thought it was a great birthday present! Very emotional... She took me to my first ever U2 concert in 1987 when I was 13 and we've been to many concerts together since. Since I've moved to Australia though we can't do that anymore unfortunately. This was also the very first time that I had seats instead of standing tickets. Although I would still rate it 8 out of 10 (with some of the other concerts that I saw easily being 12 or 13 out of 10) I do think that the sound was a bit disappointing. Especially in our original seats it sounded a bit distorted or delayed and we couldn't really hear the voice of Bono. Luckily we found some spare seats a bit closer to the stage and that was much better. All in all once again an AMAZING experience! Thank you! What can i say? have waited a very long time for this &was just truley blown away buy every thing about it,Most memorable moment,just seeing the boys walk on.Highlights,all of it.Best track,carnt pick one ,but spose ill go with Bad,With or with out you as well.thanks guys very much,please come back soon. 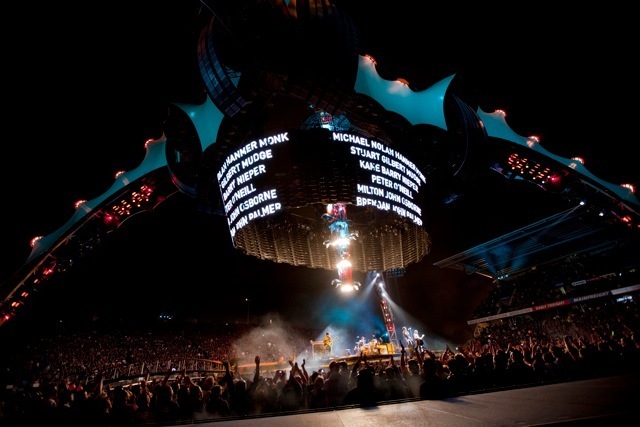 U2 needs a big thank you kiss! Sunday 12th- Flood waters were still covering our only road out - I was devastated to think that I wouldn't get to my favourite band that I had been waiting for 4 years to see but thankfully the waters receded and my experience was FANTASTIC! So hard to pick highlights - all of the songs were just superb to hear, good to hear the crowd backup with Streets have no name and Still haven't found., The stadium erupted with Vertigo, Elevation and Get on your boots, SBS & I will follow! I cried with Stuck in a moment - such a significant song in my life - it just put even extra icing on my cake! The night was so damned good we rocked up the next night and got GA tickets for the second show! 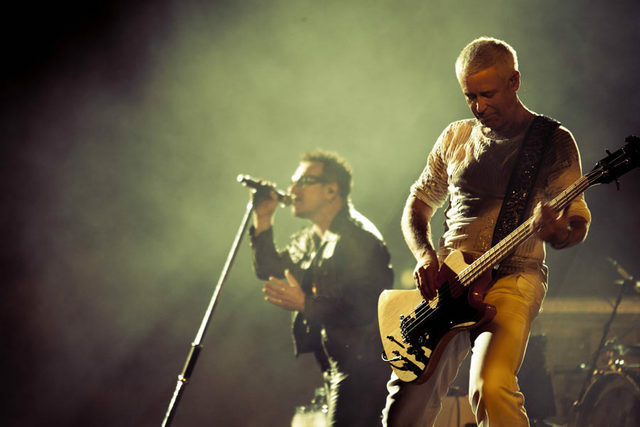 U2 the BEST! Guys, after seeing you in Melbourne and just being in awe of you, last night left me lost for words! Bad was the stand out track for mine, but really, how could you pick a favourite song from a setlist like that?! Seriously. Top notch. 3 Rows from the front and all I got all night was pure entertainment! Wow, what an incredible show! Bono has the voice of an angel and the body of the devil. Highlights - the whole show! 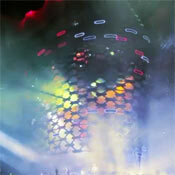 City of Blinding Lights, Scarlet and a spinetingling version of Bad were standouts however. A bit disappointed that I missed out on hearing Ultraviolet but Hold Me, Thrill Me, Kiss Me, Kill Me was pretty amazing, especially with Bono's acrobatic tricks, so can't complain. 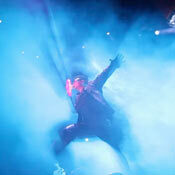 Can't believe what incredible energy Bono has - you'd never know he recently had back surgery. The whole band was in fine form and a perfect summer night to boot. Thanks for bringing this out of this world experience to Australia. As my 60 something mother said "The best show I've ever seen." This was our third show this year. Fortunate to see the boys in Paris, then Melbourne two weeks ago, and last night in Sydney in the Red Zone. I thought the Paris crowd went off...but Sydney was embrassing every moment and giving its all! Where do you start with most memorable moment? Probably Vertigo and Magnificent for me, with the later being one of their career best in my humble opinion. 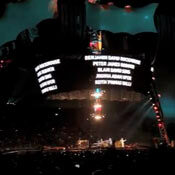 A number of fan posts are saying this tour eclipses Zoo TV.....I think I have to agree. This time around I'm 57 with grown up kids, who both went to this concert and cannot believe what they saw! 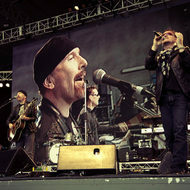 Thank you Larry, Adam, The Edge and Bono. 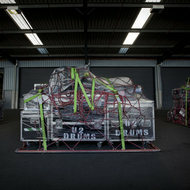 Bring on the new album in 2011and we'll see you again on the next world tour. We won't leave you! It was one of the most amazing concerts I have ever seen. SURREAL...Jay Z got everything going and then U2 rocked the house. I was in the front row of the Red Zone 2 and I can't even begin to tell you how many times bono and the boys stopped right in front of me. 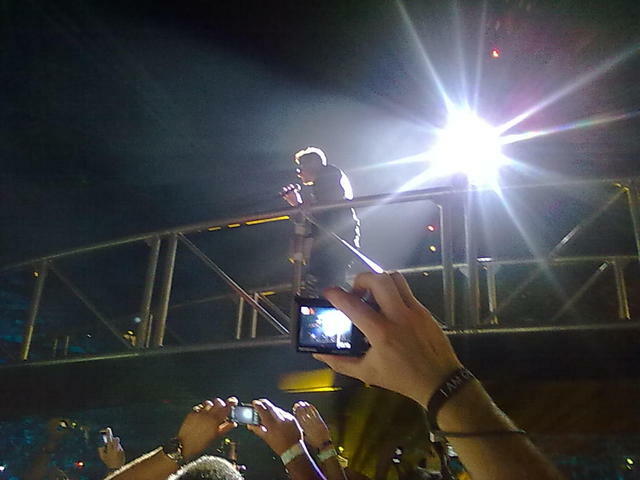 I was in arms reach.. yes I was hysterical especially when bono stopped in front and sang Sunday Bloody Sunday. The show was out of this world everything, performance, lighting, sound..Everyone was friendly and the fans. Met some really nice people..yes U2 tragics just like me. I just want to thank U2 for giving me some fantastic moments over the last 25 years. And everyone associated with the concert especially the crew who put everything together..you are amazing people. Oprah, Bob Geldof and others were in the audience....Thank you Thank you Thank you. 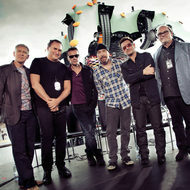 U2 are maestros at the top of their art. Best concert ever for both of us! 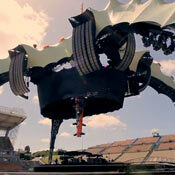 Phenomenal, jaw-dropping staging and perfect sound. As only U2 can do, they took us on a musical journey - haunting versions of ONE and WITH OR WITHOUT YOU, with deeply touching messages. STUCK IN A MOMENT was spine-tingling – everyone singing, & Bono loving it.... and we went to another dimension with the sensational performance of VERTIGO. Loved every minute – and relived an unforgettable night on the long drive back to Canberra. 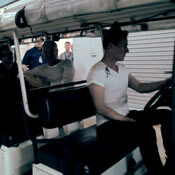 Why are U2 the best band in the world? Because they are! 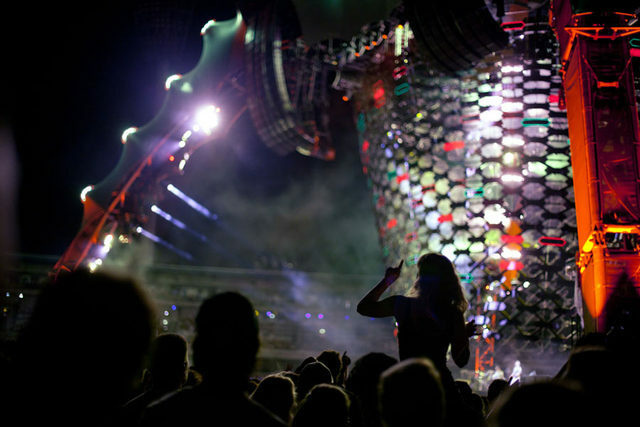 The attention to detail, quality of sound and light plus the flow of the set-list makes a U2 concert an event - not just a show. 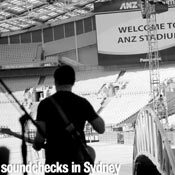 I flew 3,300kms to see the Sydney #1 show and wasn't disappointed. 'Streets' will always be a favourite and 'Magnificent' was, on a 'Beautiful Day'. BTW; thanks for fixing the dud pixels in the screen before U2 came on. Very considerate. Absolutely extraordinary version of Bad last night. Was hoping they would play it. Bono was struggling a bit with the voice and still managed to nail it and Miss Sarajevo. Wonderful wonderfl night. 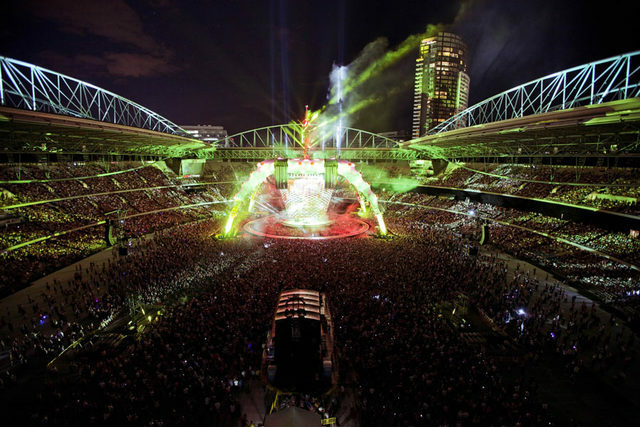 Once again they redifine what a stadium gig is all about, WOW from the moment we walked in hours before the show started staring at his massive set and once it got underway lift off was truely at hand, never sat down for a single second and sang every note at the top of our lungs! 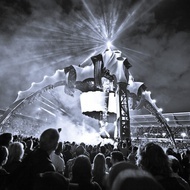 Great night, thank you so, so much, we loved when Bono said "he didnt want to leave!". Great show, great set, even some of the old Macphisto side came out, even Edge "the guy at the Xmas party fixing the office photocopy repairer" was in great form. 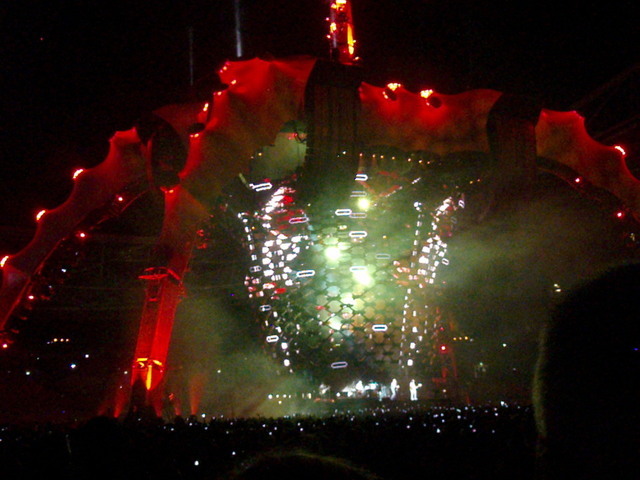 I have to say Bono was more relaxed compared to Vertigo Tour, the stage was great but not sure the sound was the best I have heard from them. If you are still considering whether to go or not just GO !!! 24 songs later they didnt want to go home ! Get there erarly Jay-z is worth it ! I haven't seen U2 on this tour yet. But this show was incredible. I got there at 7am and was 150th in line (although the way the stadium managed the crowds was pretty bad). But I got a great spot. 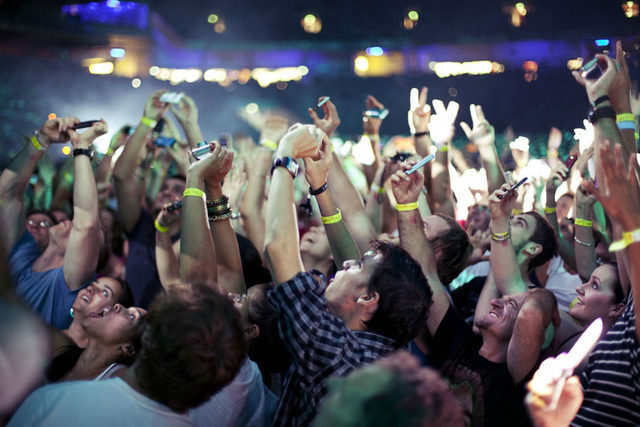 The energy of the band and the enthusasim of the crowd was so awesome to be apart of. I really don't know what words to use. 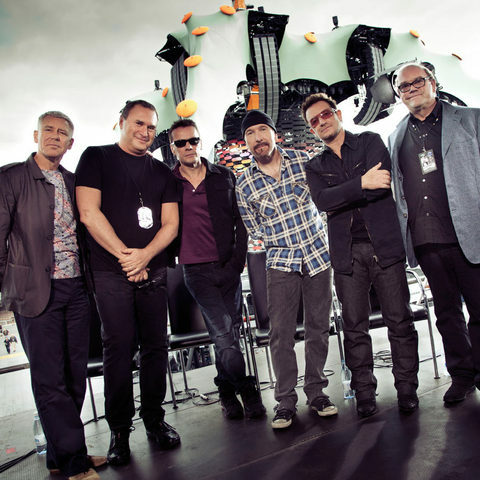 I dragged 5 of my friends along to prove to them that I am not crazy and that U2 put on the most incredible shows. And they believe me now! Jaz-Z was also really good, not music I usually like but he was great fun. Going back tonight (Dec 14) to see it again. Wow ! What a knock-out performance by the band and the whole crew delivered a spectacle that eclipsed past shows. I never thought I would get to hear Bad as it really hasnt featured much in set lists for some time and then to also catch Hold Me Thrill Me Kiss Me Kill Me....I'm backing it up on the second night as well and hoping to hear much of it again but also a few new tracks.... I caught the sound check and hope I get to hear love rescue me , Mercy or even Levitate. Please ! I've found what I'm looking for! Absolutely awesome. Best show since Zoo TV, and may even surpass that! Fav moments were "I Will Follow", "Bad", "Elevation", "Vertigo", "I'll Go Crazy" and the crowd singing "I Still Haven't Found" and "With or Without You". Thank you guys for a fantastic evening!!! I never thought I would see anything as good as Zoo TV again. 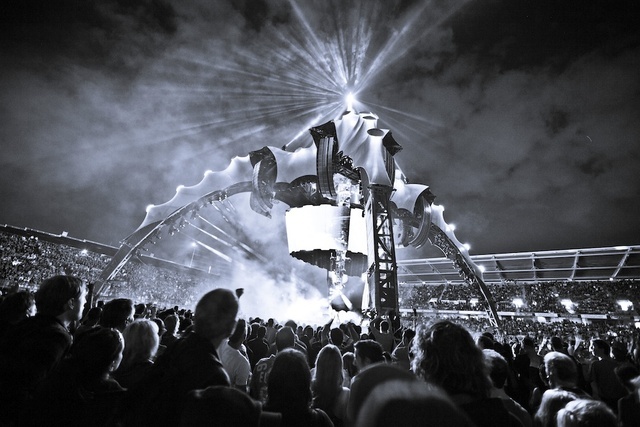 The 360 Degree show has eclipsed that and become the new benchmark for Stadium Rock shows. Loved it so glad I went. Elevation and Vertigo absolutely awesome. That was the best show ever. I loved every minute of it in the Red Zone. Thank you thank you thank you! !